Alex Torres had a terrific night, Frank De Los Santos did not. In fact, Mr. De Los Santos isn’t having a very good year. In 11 appearances he’s only managed 12⅔ innings. Last night he didn’t make an out. Have to wonder if something could be wrong. Nevertheless, sure is great to see Alex Torres apparently beginning to live up to his promise. And Shelley Duncan got his first hits as a Durham Bull. Plus Leslie Anderson got a homer. 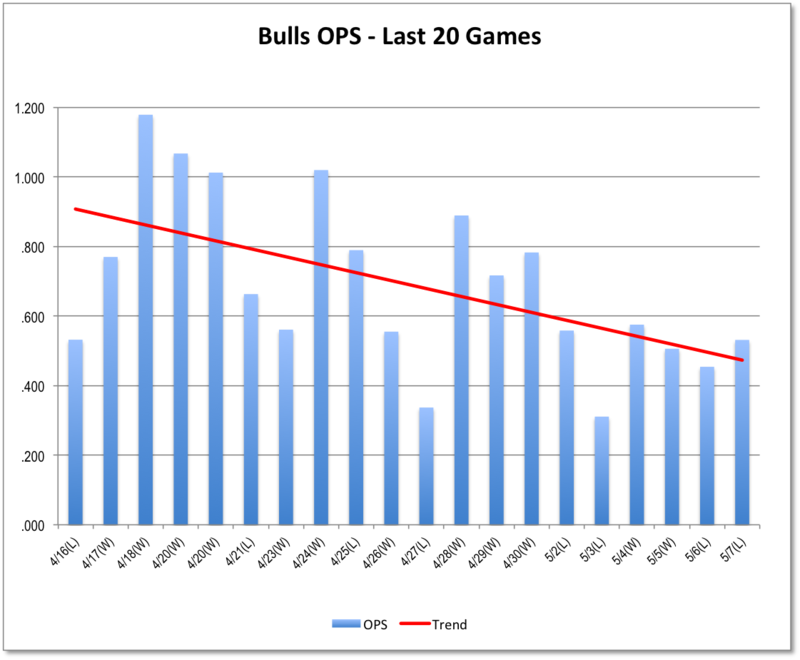 On the other hand, see the chart below showing the slippage in Bulls hitting over the last several games. Guess the stats geeks might call it “regression to the mean.” For us normal folks, let's call it a “slump”. Tarp on the field at 8:30. Not sure I can cope with screaming kids waiting for the rain to stop. Could Aroldis Chapman throw a golf ball 16 giraffes high? 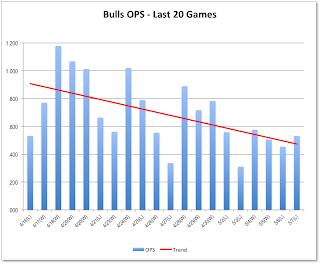 New blog in the area, DNA of Sports, has a terrific story on Bulls reliever Steve Geltz. Kinda hard to figure out who the writers are, but it's a good story. A bit more on the DPAC deal with City of Durham.